What do you get your Dad on Fathers Day? If your dad is anything like mine, he’s the sort of bloke who has everything! But that’s no excuse not to show him some love this Sunday. No matter how many cufflinks, gadgets or car accessories he has, I can always guaratnee that he’ll enjoy a treat to eat or drink, so here’s my round up of my favourite Fathers Day gifts for foodies. I genuinely don’t know anyone who doesn’t love chocolate. My dad is the sort of guy who always has a big bar of Whole Nut stashed somewhere in the fridge, but gifts call for posh chocolate. 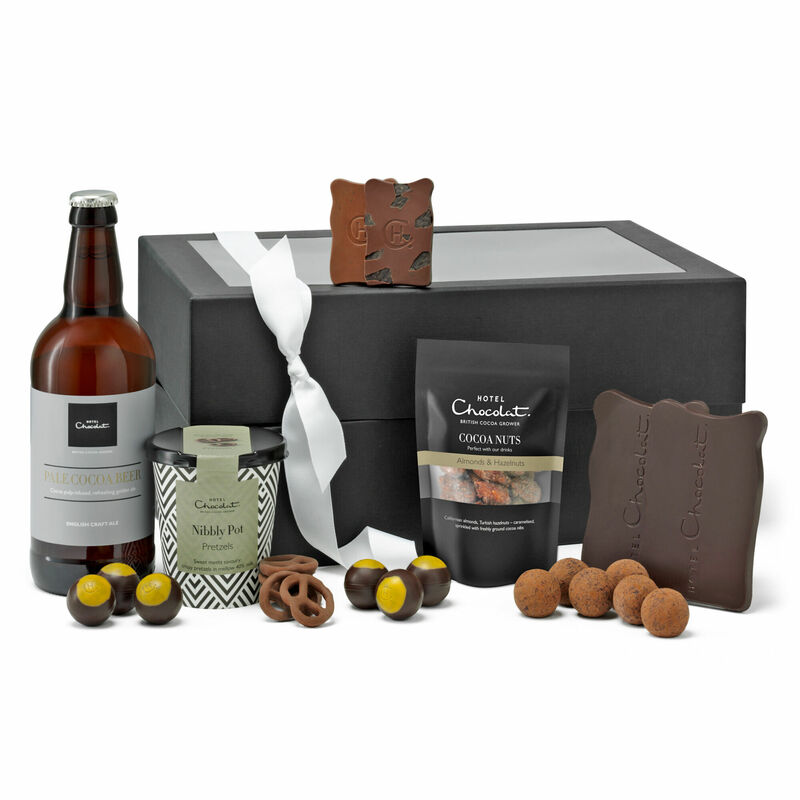 I love Hotel Chocolat, their range of Fathers Day gifts spans chocolate H boxes through to gin and chocolate pairing hampers. My favourite (and, I think, best value for money) is The Beer Hamper with cocoa infused beer, chocolate slab and a bunch of chocolatey snacks for your dad to enjoy in front of the footy, Forumla 1, or whatever he fancies. There are so many great things to drink at the moment, from small batch craft beers to top quality single malt whiskies. If your dad likes to imbibe, you’ll be his favourite with one of these gift ideas. Bro-Quet have a small but perfectly formed range of gifts. Their Father’s Day Craft Beer Bouquet comes with 3 bottles of craft beer, a snack, bottle opener and bucket to fill with ice to keep your beers cold. The Ross & Ross Best Dad Ever Man Box has a bottle of premium Cotswold lager, artisan salami, pork crackling and a jar of smoked apple chutney, all designed to go together for the perfect beer break. Dad more of a cider fan? Head to The Snaffling Pig to pick up a Cider & Crackling Crate of Awesomeness with Hogs Back and Orchard Pig Cider, and a jar of award winning pork crackling in your choice of flavours. I can highly recommend Habanero, Black Pepper or Ham & Colman’s Mustard. Only choose the Pig of Doom for the hardest of Dads – they’re seriously hot! For the distinguished Dad that likes a little dram, give him a whisky tasting experience from The Birmingham Whisky Club. Their wonderful team with unparalleled whisky knowledge will guide your Pops through a selection of different whiskies at one of their themed nights. Chilli loving Dads, rejoice! My recommendation for you is one of my absolute favourites! Pip’s Hot Sauce are based here in fair Birmingham, and have gone from making a few bottles to sell at street food markets, to one of the best and most respected hot sauce makers in the country, with their fair share of awards under their belt. The Pip’s Hot Sauce Taster has a selection of their best sauces in miniature, including the original and classic La Boca Del Diablo: a smokey, spicy sauce that works with everything from smashed avocado and poached egg, to steak and chips. My Dad enjoys a spot of cooking, and a lot of his inspiration comes from the Hairy Bikers. For carniverous Dads, their Meat Feast cookbook is sure to whet their appetite. You never know, he might take the hint and invite you over for Sunday Lunch! Dads always seem to love a barbecue too, so up their grill game with The BBQ Book from Christian Stevenson, AKA DJ BBQ. Hand-picked by Jamie Oliver, Christian’s passion for barbecue is clear, as he brings proper US style grilling techniques and recipes to your back yard. For spice lovers and curry aficionados, give the gift of flavour with a Masalla Dubba spice tin from Spice Kitchen. Shashi and Sanjay, a mother and son team from Birmingham, have built an amazing reputation for themselves, with their top quality spices (their garam masala won a great taste award) and stunning presentation in traditional tins with handmade covers made from sari materials. Once he’s made a curry with one of these, he won’t want to do it any other way! If Dad’s more into eating than cooking, a Gourmet Menu Tasting Experience from Edmunds French Bistro in Birmingham is a lovely gift you can enjoy together, with six courses celebrating classic French cuisine. Having dined at Edmunds myself, I can wholeheartedly recommend it for a lovely experience. Then for dads who fancy themselves as budding chefs, give them a Michelin-starred experience hosted by top chef Brad Carter at his eponymous Birmingham restaurant. Brad is famous for creating the WOW factor, and this experience has plenty of it, because as well as the five-dish tasting menu, he’ll get to create his dessert in the kitchen with the man himself. Happy Fathers Dad to all the dads out there. Crack open a cold one and enjoy your day!